Labor Minister Salim Jreissati criticized in remarks published on Wednesday Foreign Affairs Minister Adnan Mansour’s call for a meeting of Arab foreign ministers to denounce the anti-Islam film , branding his move ” unconstitutional”. “What Mansour did was unconstitutional because Article 52 of the Lebanese constitution stipulates…that the FM must consult with the president before making such a move ,” Jreissati told Al-Jumhuriya newspaper. The movie “Innocence of Muslims,”mocks the Prophet Mohammed and portrays Muslims as violent people. Mansour’s announcement came a few minutes after Hezbollah chief Sayyed Hassan Nasrallah called for anti-Islam film protests throughout Lebanon. Mansour’s announcement also came a few hours after Pope Benedict left Lebanon for the Vatican, ending a three-day visit in which he urged Arab leaders to serve justice and peace. 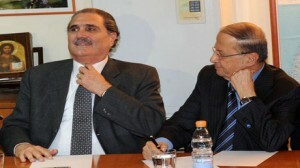 Jreissati’s criticism of Mansour may signal a rift between his boss MP Michel Aoun and Speaker Nabih Berri. Mansour represents the the Amal Movement which is headed by Berri and Jreissati represents Free patriotic Movement which is headed by Aoun. Just shows who is ACTUALLY running the government.